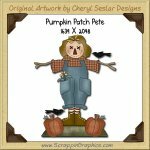 This instant download will add a touch of prim to any Halloween project. 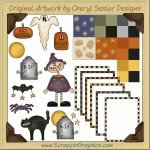 This set includes 39 different graphics: 7 coordinating backgrounds (green checks, grey checks, orange checks, faded pumpkins, stars of blue, stars on orange, yellow checks) 6 coordinating frames (black checks, blue checks, gold checks, orange checks, purple checks, tan checks), bat and moon, candy corn, black cat, black cat/tombstone/pumpkin group, 3 different framed art, full moon, ghost, ghost with tombstone, moon with headstone, various jack-o-lanterns, pumpkins, witch, skeleton, spider, 2 spider web corners (with & without spider), star, tombstone, tree with moon, witch with pumpkins. 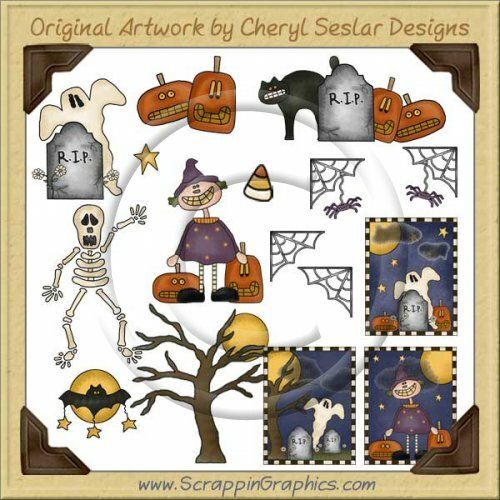 Great for making Halloween scrapbook pages, invitations, party items and other printables. 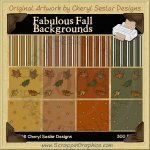 These large 300 dpi graphics work well for your printing and crafting needs but can easily be reduced in size for use in web designs. The graphics come in high quality JPG and transparent GIF formats. 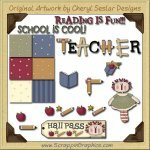 Backgrounds and frames come in JPG only.